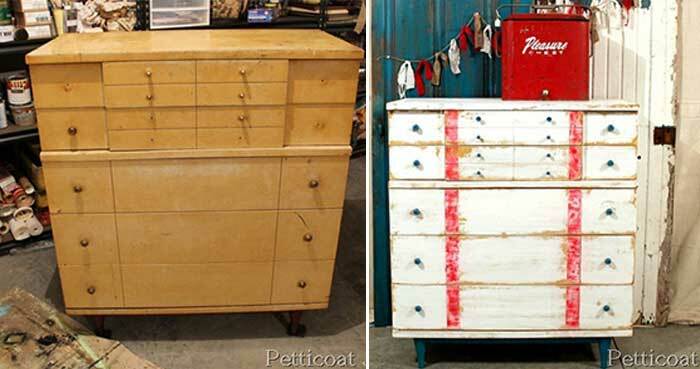 If you like to give old furniture a second chance, you will love some of these creative dresser makeovers! Not only have they been repainted but they have also been given an entirely new look. Patterns, textures and repurposes all change the looks dramatically. Each of these ideas should inspire you to dust off that old dresser that you have sitting in storage. Of course it might make you feel motivated to go out and purchase a thrift store deal. Then, you can turn into something spectacular! This first dresser makeover, by Petticoat Junktion, looks like an entirely new piece in it’s new nautical style. The combination of the distressed paint technique and different colors give an old dresser tons of style. Consequently, a fun design like this is really thinking outside of the box. New knobs and a flower ad graphic add a unique look to the soft bright green paint makeover to this dresser. Because of this, the dresser makeover looks fresh and lively. 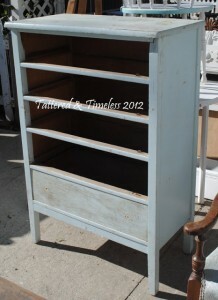 The dresser drawers on this one were sanded down to the raw wood for a nice contrast with the painted dresser. Also, for added interest to a beach theme, the names of the local beaches were painted across the faces of the drawers. 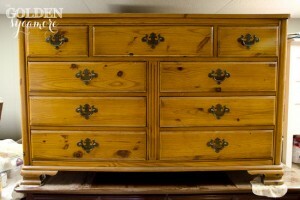 Check out the dresser makeover by Tattered and Timeless. 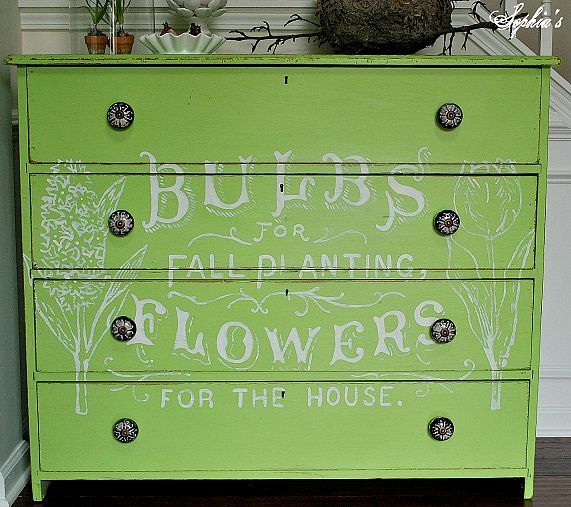 Sometimes an old dresser can be repurposed into an entirely new use. 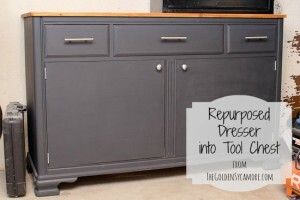 By changing out the hardware, replacing drawers with doors, and giving a new color can make a tool chest! Because this is so unique, you will want to check out the details on this makeover by The Golden Sycamore. Finally, I can’t believe the difference in this last makeover! I love the fact that burlap was used to cover the face of the drawers. So, to try this yourself, see all that went into renewing this piece by visiting Stone Creek Antiques. Thanks for the feature Renee!! Thanks for the feature. Sorry for being so long in my thanks. I just learned what pings are so I didn’t know till now. You’re welcome Tammy! 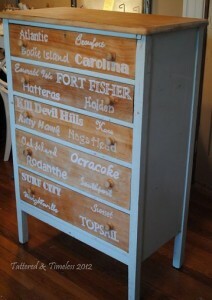 I love how you have the local beach names painted across the drawer fronts!